Some of the world’s biggest container operators, including China’s Cosco Group and France’s CMA CGM, agreed to form a new shipping alliance that will rival the dominance of giants Maersk Line and Mediterranean Shipping Co. in the lucrative Asia-to-Europe ocean trade. The new grouping, to be called the Ocean Alliance, also will include Hong Kong’s Orient Overseas Container Line and Taipei-based Evergreen Marine. 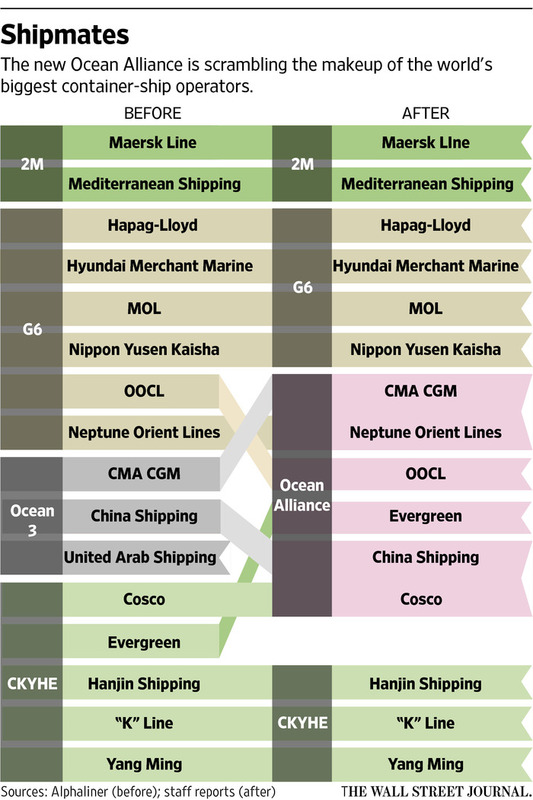 The formation of the alliance is subject to regulatory approvals from the U.S., the European Union and China, all of which have closely scrutinized a series of full-blown tie-ups and looser partnerships recently in the container-shipping business. The Wall Street Journal reported the formation of the alliance on Tuesday. Mais c’est de 2014, il va falloir profondément remettre ce truc à jour.